Remington produced 11 distinct knife patterns that have bullet shields. Each one is listed below. Please note that we are including only the old original bullet knives made by Remington. There were many reproductions made after the company ceased its knife manufacturing operations. The Camillus Cutlery Company made most of them & many are quite valuable in their own right, but this page is dedicated to showing the originals. So, without further adieu, check out these eleven great knife patterns listed below & make sure to stop by our store when you’re done here & shop for Remington pocket knives in the AAPK Member store! 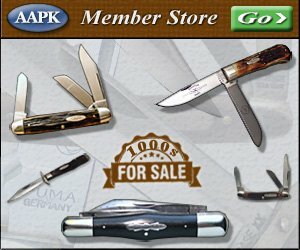 Original bullet knives don’t come up for sale everyday, but every once in a while you can catch one. This bullet pattern is a 5 1/4″ Jack knife known as a Hunter, Trader, Trapper. They all have two blades. The master blade is a clip blade and the second is a spey. They were only produced with brown bone handles. 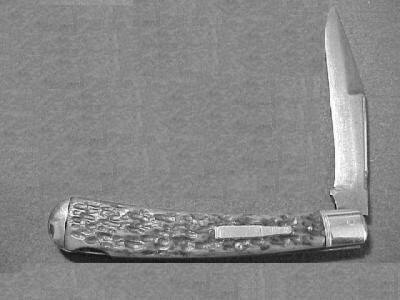 Remington produced two bullet knives with the same blade configuration and frame but different handle material. They are the r1123 and r1128. 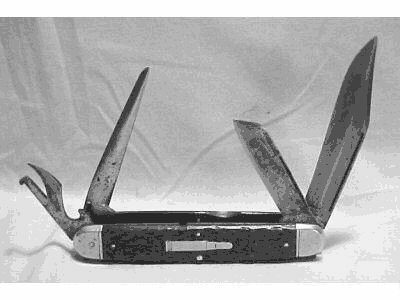 Both are 4 1/2″ Jack knives known as trappers. They all have a spey blade and a clip. They do not have rear bolsters, and are drilled for a lanyards. One version has brown bone handles, and the other has cocobolo wood handles. The bone handled knife’s pattern number ends with a 3 and the cocobolo’s with an 8. The knife on top is bone. The one on bottom is cocobolo wood. 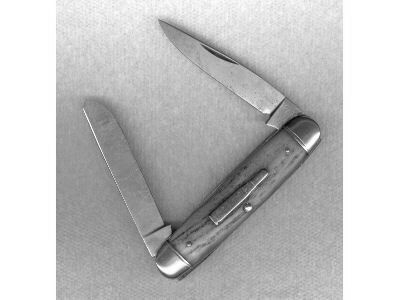 This pattern is a 3 1/2″ Jack knife known by most collectors as a baby bullet. It is basically the same as Remington’s R1123 pattern trapper except that it is 1″ shorter. This pattern was produced with bone handles only. It has a Clip and spey blade. 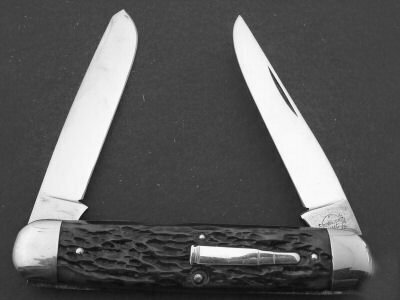 This is a 5 1/4 ” Jack knife known as a lockback hunter. It has a single clip style blade. 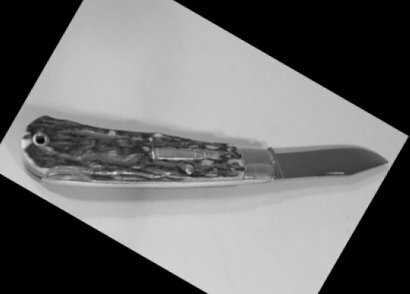 The pattern was only manufactured with brown bone handles. Some have been produced with a bail, but usually not. 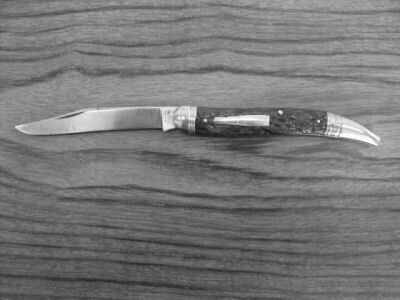 This pattern is a 5 3/8″ Jack knife known as a Trapper. It has two blades, a clip and a short pen blade. The bolsters are grooved. Remington produced with bullet knife with brown bone handles only. This is a 5 3/8″ Jack knife known as a trapper. It is a two bladed-knife. There is a clip and spey. This pattern was produced with brown bone handles only, and has grooved bolsters. This pattern is a 4 1/2″ lockback folding knife. It has a single clip blade, and the rear of the knife is drilled for a lanyard. 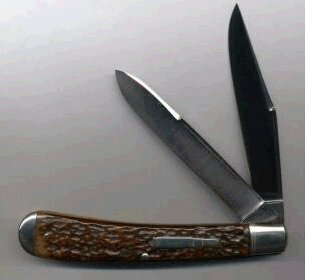 It was produced with both brown bone and genuine stag handles. 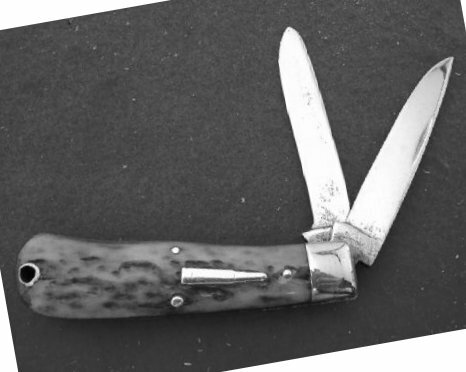 The bone handled knife’s pattern number ends with a 3 and the genuine stag’s with a 6. I have seen bone handled patterns in near mint bring $850 or more. 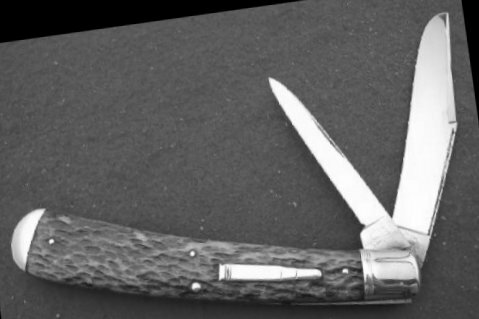 bullet pattern is a 5″ Jack knife that most collectors call a toothpick or tickler. It has single long clip blade and has grooved bolsters. 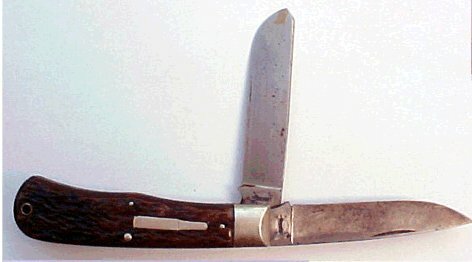 Remington only produced this knife with brown bone handles. This pattern is a 4 3/4″ multi-bladed knife known as a camp knife. There are four blades; a clip and sheepsfoot extending from the front, and a can opener and punch blade on the rear. The knife has grooved bolsters, and has a bail. It was only produced with brown bone handles. This knife is known as a big muskrat or big moose. It measures 4 1/2″ and has two blades that extend in opposite directions. One is a clip and the other is a spey. They were only produced with brown bone handles. This pattern is called either a moose or baby muskrat. They measure 3 3/4″ and have two blades that open in opposite directions. The front blade is a clip, and the rear blade is a spey. 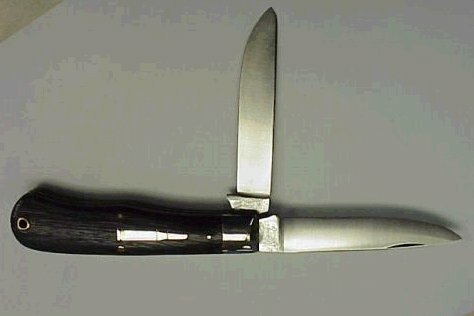 Remington only manufactured this bullet knife with genuine stag handles.